Aboriginal people have always planned for their communities. 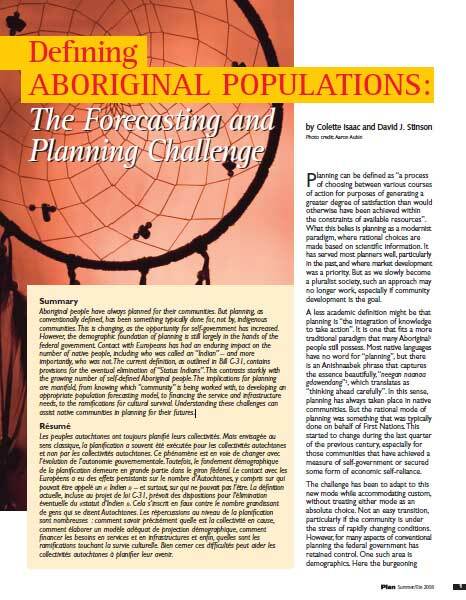 But planning, as conventionally defined, has been something typically done for, not by, indigenous communities. This is changing, as the opportunity for self-government has increased. However, the demographic foundation of planning is still largely in the hands of the federal government. Contact with Europeans has had an enduring impact on the number of native people, including who was called an “Indian” – and more importantly, who was not. The current definition, as outlined in Bill C-31, contains provisions for the eventual elimination of “Status Indians”. This contrasts starkly with the growing number of self-defined Aboriginal people. The implications for planning are manifold, from knowing which “community” is being worked with, to developing an appropriate population forecasting model, to financing the service and infrastructure needs, to the ramifications for cultural survival. Understanding these challenges can assist native communities in planning for their futures.